This luscious publication, by Lark Books, featuring art quilts from 363 artists and an insightful Introduction by the juror, Karey Patterson Bresenhan, deserves a place beside an easy chair for reading page by page. 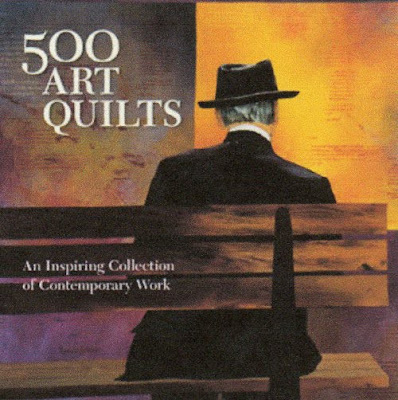 Art lovers and quilt lovers will both relish this one. I find a cup of tea and my legs up make for a relaxing stroll through the pages of this 8 inch square book. In the essence of full disclosure, I am one of those quilters, with two of my recent works in the book on pages 325 (Spring Rhapsody) and 406 (Summer Split). Each has been given a full page and details. I couldn't be more pleased with how well they made my work look. While chock full of wonderful pieces by artists from around the world, the book fits easily in the hand and is the size I love to pick up and browse through time after time. Karey has chosen a wide variety of work that well represents the breath of work seen today. Karey's introduction places this work in context with her statement: "Quilts created as art, destined from their inception to be displayed on walls, began to be noticed and acknowledged during the last quarter of the twentieth century. These art pieces are made with needle and thread instead of paint and brushes, but their creators' kinship to the painters of the past is as strong as their connection to women who hand-sewed traditional pieces in order to keep their families warm. Today's quilters draw from both sources. They've established a new genre of art." Emphasis mine. The book can be obtained from Amazon and from other major book stores. This would make a lovely Mothers' Day present. Let me know what you think of this little book.